Discussion in 'Notice Board' started by adamcbassett, Dec 2, 2018. An artist feature with illustrator Anna Hannon. 2 interviews, featuring Author Ellis Knox and YouTuber Tim Hickson (Hello Future Me). 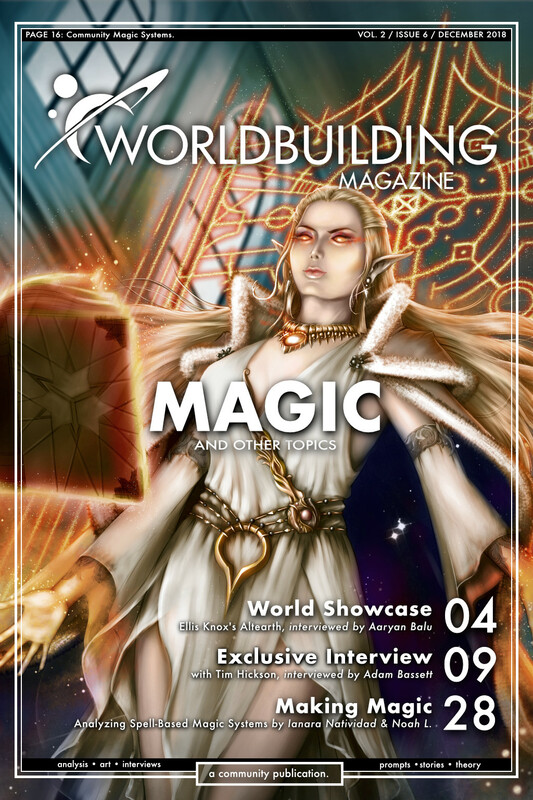 4 articles on worldbuilding written by dedicated staff and community members. 8 new prompts for worldbuilding and writing. Once again, we hope that you find this issue helpful in your worldbuilding. If you liked it, have any comments or suggestions, or would like to offer some critique, please leave us feedback for this issue. Also, if you would like to help in the production of the magazine, we’re always looking for new artists, editors, writers, and other organizational help. If you’re interested in helping please comment below or visit us on our Discord server. skip.knox, CupofJoe and Svrtnsse like this.